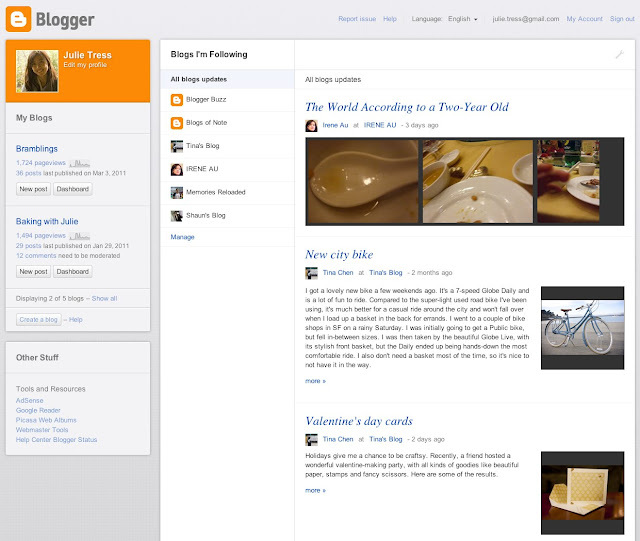 Precisely on Tuesday, April 19th 2011, Blogger announced the public launch of their redesign! But it was going to be gradual rollout that will start with a limited set of users who visit the new feature testing ground, Blogger in Draft. Blogger says that at the start, only some lucky bloggers would see the new design on Blogger in Draft. Over the course of the next few days and weeks they’ll ramp up to support all Draft users. Please note that there is no sign-up or activation process required; but ONLY a wait-and-see approach, as you’ll notice your dashboard change to the new design when you log in to Blogger in Draft. Although the Blogger team has been hard at work cranking out tons of new features over the last year or so, it’s been a while since Blogger user interface has had a major update so Blogger’s fresh new look is exciting. However, there’s much more to the redesign than shiny new graphics and pages—Blogger has essentially rewritten the entire application from scratch, using the latest web technologies that will enable them to make future updates in more agile and flexible ways. Blogger has decided to make the new UI available to loyal Blogger users as quickly as possible. Blogger realizes there might be some ‘rough edges’ (see this page) but is continually updating and improving the experience until it’s ready to graduate from Blogger in Draft. The team is also very eager to hear your feedback, so please don’t hesitate to let them know of any bugs or suggestions by clicking on the “Send feedback” link in the navigation bar (or directly on this form). Blogger promises "...this is only the beginning of many exciting updates that we’re planning for Blogger this year, so stay tuned!"